I just wanted to drop you a line and say thank you. I've been in music for a very long time and it's rare these days to see a store with employees such as yours. Professional, helpful, knowledgeable, and just generally cool people. 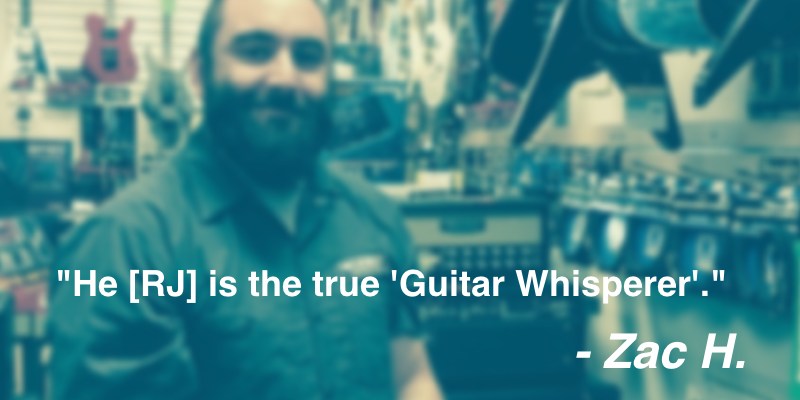 R.J. in particular has gone above and beyond in helping me make informed purchases, whether it was my Mesa Boogie rig, my Ibanez 8 string, a Tama drum set, or even pick ups for one of my other guitars, he knows his products and goes the extra to make sure it's right. All too many times customers are quick to jump on the negative, but not near as quick to thank for great service and care. I just want to thank you and your crew for everything and for making me feel at home every time I walk in your store, whether it's for strings or a new piece of gear. I just wanted to take a minute and say thanks again for all your help. I don't know if you remember me or not, but I'm the one who broke the back off of a Roc 'n Soc seat. You sent it back for me at no charge. Not only that, but you gave me a loaner while it was gone. I think of your service every time I get my throne out to play. I'm sorry I didn't write sooner, but I finally decided just telling you “thank you” when I picked it up wasn't enough. I am very impressed by your business ethic. Your kind of customer service is, sadly, becoming rare these days. I can't tell you how much I appreciate that! I play about two four-hour jobs a week and having a good seat makes all the difference in the world. The fact that you did all that for me (and I had that loaner several weeks!) at no charge is wonderful. I'm not even a particularly special customer. I don't spend hundreds of dollars at your shop every month. But I'll tell you one thing, I liked your store before. I've always thought you were friendly, helpful, and fair. But with service like this, you have a loyal customer here for life! Not only that but I've become a promoter. I tell everyone I know to shop at your store! You are the greatest. Keep up the good work. I wish you the best and all the success that you deserve! I am writing to compliment the outstanding customer service that I received on a recent Reverb.com purchase. 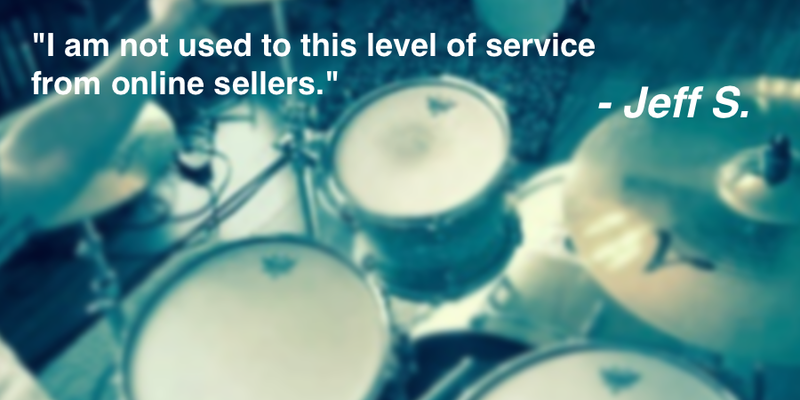 Kelly went the extra mile to find the drum parts I needed, and was very responsive at every step of the sales process. Kelly was a pleasure to do business with, and is an excellent representative for Supersonic Music. 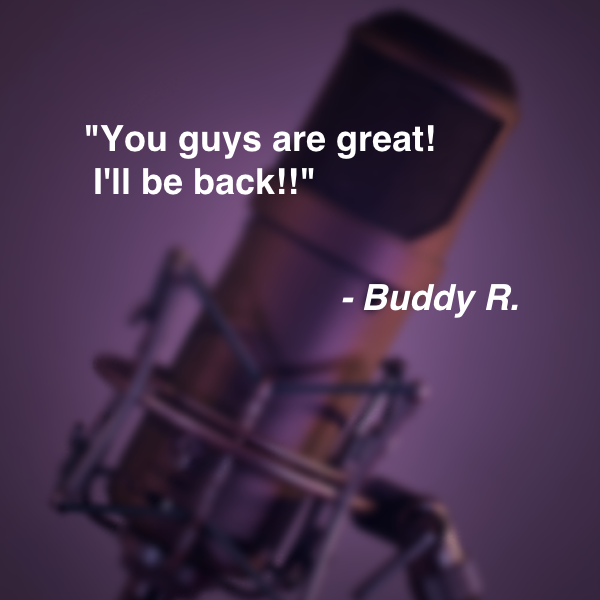 I left a review a day or so back, but I wanted to make sure I told you in person how much I appreciate your service. You guys are great! I’ll be back!! I started out on Ebay looking for a drum set. I came across a set being auctioned by Supersonic Music. The item was a great item but, not quite what I was after. I went to Supersonic's online store where I found a set that was a perfect fit. I emailed many questions to Nick who not only was glad to answer them for me but, did so in no time at all. I am not used to this level of service from online sellers. After a few rounds of emails I bought the kit I found on the online store. Nick promised that the set would be shipped the day he sold it to me. Within hours I had the tracking notification that the kit was enroute and would be here in 2 days. I am writing this letter to say thank you for the wonderful service I have received as a customer at your Topeka store. Recently, I purchased a beautiful new Ibanez GSR bass guitar from you guys; a really great quality bass at a truly amazing price. Of course, that's one of the main reasons I frequent your store: I can find professional quality gear at reasonable, affordable prices. It gets even better. When I got my new bass home, I discovered a tiny defect: a small mar in the finish that must've simply gotten past the factory inspectors at the manufacturing plant. It was such a minuscule problem, I was afraid I was perhaps just being nit-picky... you know how musicians can be about their instruments... I decided to bring it in and show my problem to the sales guy, anyway, and I am so glad I did! Not only did you guys examine the guitar and listen patiently to my problem, but you actually took my problem seriously. And, rather than simply send my guitar away to be repaired, you ordered me a spanking-new replacement: The same model, brand.. even the same color, absolutely free! Back in the days when I used to shop the pawn places for musical instruments, I'd often have to take the junk back and complain... only to be sneered at, and treated like a leper. But at Supersonic Music, I was treated like a valued customer. Dave, the guy who helped me, got right on it. He called the guitar company the same day I came in, and my new, perfect replacement arrived in only one week's time! He even made sure I had a bass to play in the meantime, while I waited! 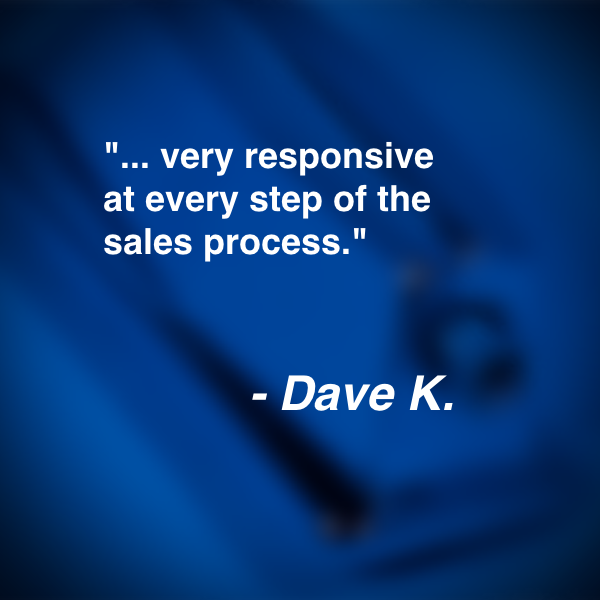 I am very pleased with the outstanding level of service I received. Overall, Supersonic Music is now the only place I go with my musical needs. I've been to a few of the other “music stores” here in town, only to be followed around and treated like some kind of homeless guy or shoplifter by some summer-job clarinet-nerd sales dude, because of my tattoos and rock-and-roll appearance. But the guys [and girls!] at Supersonic are always friendly, super knowledgeable, and always willing to do whatever it takes to keep me rockin'! Thanks for running the BEST MUSIC STORE IN TOWN!